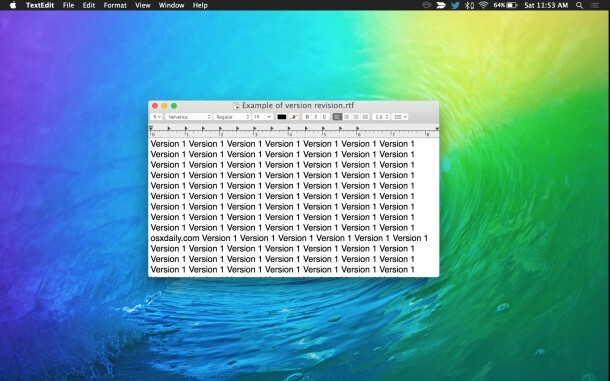 All modern releases of Mac OS X include a powerful built-in version control system that allows a user to revert to any previously saved version of a file or document, assuming the app supports the version revision feature. This ability is often overlooked by Mac users, but it can be a real lifesaver when you’ve caught yourself having modified a file inadvertently, or discovered that recent changes to a document should be undone. In some sense, you can think of this feature like a file-level “Undo” feature included in OS X, and it works fairly similar to the Time Machine backup browser on the Mac. 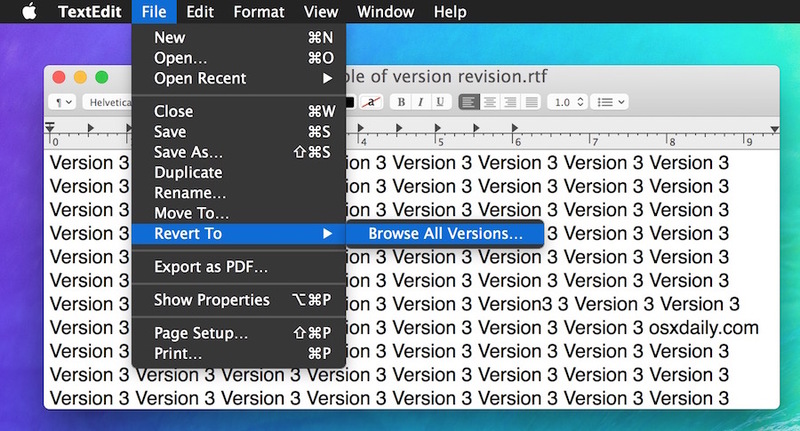 We’re going to demonstrate the Revert To feature with version revision in the TextEdit app of OS X, but you’ll find the feature in many other Mac apps as well, like Pages, Keynote, and Numbers. Keep in mind this will only work for a Mac file that has been generated locally and thus is using the Versions feature cache, files that are sent to you or downloaded from elsewhere will (almost certainly) not contain the revision control data necessary to revert to a prior version of that document. Once you choose “Restore” the chosen previously saved version of that file will open immediately, reverting from the other version of the file to that selected revision. In case you were wondering, yes you can also go backwards again by returning to the Revert To menu, or, if you want you can instantly revert to most recently saved version by choosing that from the same Revert To menu as well. This feature depends on specific applications supporting it, though it has been around in OS X from quite some time, including El Capitan, Yosemite, Mavericks, Mountain Lion, and Lion, not all developers have included version support in their applications yet. Nonetheless, it’s always worth a try, certainly before you dig out the Time Machine backup drive, though Time Machine is still going to be necessary for reverting to prior versions of files when the origin application does not support Versions. Finally, it’s important to point out that if you disabled auto-save or turned off Versions for some reason or another, you will not gain the full effect of this feature. 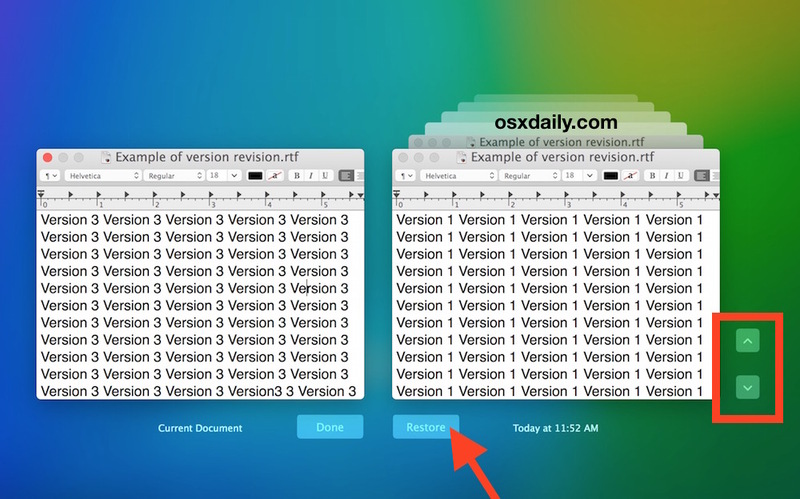 Additionally, if you happened to have cleared the versions history or auto-saved caches for the files, there will also be no version control for that particular file, or any others where the caches were removed from the Mac – this is the same reason why you can’t perform version reverting on files that are not created on your own Mac, the cache and version control files simply do not exist in that case. A list of applications supporting Versions would be handy.